Your privacy is of the upmost importance to us. We value the trust you place in us, and we remain committed to safeguarding and protecting all your personal information that is provided to us. At times, we will update this page to inform you of any changes that are taking place, so you always are kept aware of how we are handling your personal data, and how cookies are used on our website. You'll also find information regarding how to contact us regarding your personal information and how it is used. Portugal Homes offers online property-related services on our website, through our apps, and with other online platforms, such as those on social media and the websites of our partners. The following information is regarding the use of each of these platforms. Portugal Homes may amend the Privacy and Cookies Policy at any time, as deemed necessary. Please regularly visit this page, so you are kept informed of the latest changes that are made. If at any time you disagree with the content found in the Privacy and Cookies Policy, you should discontinue using our services. What are forms of personal information used on Portugal Homes? We may also receive your information in relation to social media services that you are using. Why does Portugal Homes collect, use and share your personal data? Customer Service: We offer international customer service seven days a week, through the local office in Portugal. Our team can provide a multilingual service to our customers. When you share your details with our support team, we can better respond to your needs. This includes helping you to find the right property for your needs, along with answering any questions that may pertain to the Enquiry. Marketing Activities: The information you submit will also be used for our marketing activities as the law permits. For example, if you make an Enquiry with us, we may use your contact information to send you news about properties that are for sale or our services. With your consent, in areas where this is required by local law, we might also send you other newsletters we offer through your e-mail. You may opt out, or unsubscribe, from any of these marketing communications at any time. Simply click on the "Unsubscribe" button that is found in each newsletter. With the information you provide to us on our website, we may provide you with individualized opportunities on the Portugal Homes website, through mobile apps or even on third-party websites, this includes opportunities listed on social media sites. These offers might be based on offers you Enquire about through the Portugal Homes website, or third-party offers or products we think you might find interesting. In cases where we believe a property is of interest, our staff might contact you over the phone or through e-mail. As you use our services, we might invite you to answer a questionnaire or to provide us with a review of your experience that you had at Portugal Homes. We may send you additional materials based on your Enquiry history, such as ways you can contact us at Portugal Homes. Our team may also send you information about properties and developments that are forthcoming, or even a price reduction that appears on previous Enquires you have done through Portugal Homes. Improving Our Services: Finally, we will use personal data provided for analytical purposes, to improve our services, boost the customer experience, and to improve all the functions and the quality of all our online services. How does Portugal Homes use social media? We use social media to promote our properties and to improve and facilitate the services we offer. For example, we use social media plugins as part of the Portugal Homes website. Each time you click on these social media buttons, the information is shared with the social media network and presented on your social media profile. Along with these buttons, Portugal Homes also uses social media apps on several of our social media websites. The websites may allow you to share your information with us at Portugal Homes. How does Portugal Homes share your data with third parties? There are some cases where we may provide your personal data with third parties. Enquiries: As we respond to your Enquiry, we might need to transfer some details about the Enquiry to our vendors of the property, that you have enquired about. This might include your name, contact information, how you purchased the property, and what preferences you made as part of the Enquiry. This information may also be used by Portugal Homes and any of the vendors at these properties. Third-party Service Providers: There are times we may use service providers, such as data processors, to help us to process your data on our behalf. This processing helps us to better facilitate the Enquires and to send our marketing material and analytical support services. These processors are all bound to confidentiality clauses and they are not allowed to use your personal information for anything else. Competent Authorities: We will abide with all laws as required in terms of providing personal information to government authorities and law enforcement agencies as required for the detection, prevention, and prosecution of fraud and criminal acts. Business Partners: We will work with our business partners across the globe to properly advertise and distribute property listings and to help our venders to sell their properties, or promote their business partners. This may mean that their services are integrated into our website or they have been enabled to show a customized property advertisement on our website, or we are advertising on theirs. When you make an Enquiry on one of our business partners' websites, certain personal data that you give them will be forwarded to us. There are times when some of our business partners may receive your personal data from us if requested by you. When you make an Enquiry on a partners' website/property Portal, it is vital you take the time to review their privacy policies. How does Portugal Homes use mobile devices? Portugal Homes offers a mobile-optimized version of our website. The mobile site provides you with substantially the same security and functionality as our website. Cookies help us to remember who you are. Like any other website, our site doesn’t recognize you when you visit a page on our site. Cookies give us the ability to recognize you across all our site’s pages and to remember choices you make, including language and search criteria preferences. Cookies also let us recognize you when you return to our website for subsequent visits. There are several various kinds of cookies, each of which has a different purpose. Cookies can be classified by their duration, their function and by who places them on websites. Technical Cookies: Our site is designed to be as user-friendly as possible and to learn the needs and wants of our visitors. To provide you with this exceptional user experience, we use technical cookies to help display our site to you and for a variety of behind the scenes technical purposes. They’re an essential part of how our website functions and provides you with the features you see on the site. Functional Cookies: Functional cookies help us to remember your preferences to make our site as easy as possible for you to use. For instance, these cookies help us to remember your preferred language, your preferred search criteria and which properties you’ve viewed on our site. While functional cookies are not essential to the functionality of the site, they ensure a better user experience and provide key features to users like you. Analytics Cookies: These cookies help us to understand how people use our website, to assess what’s working well and what needs improvement and to offer the best, most relevant content to our visitors. They are an important part of the constant process of improvement and optimization that we do for the site. These cookies collect data which includes which pages you entered and left our site from, which pages you’ve visited and when you visited them, the number of clicks per page, scrolling activity, search terms you use on the site and any other text you type on our website. Analytics cookies are also an integral part of our online advertising efforts which tell us how people use our site after seeing advertisements for our site online, whether these are on our site or third-party websites. Commercial Cookies: The commercial cookies on our website include both our own cookies and third-party cookies which are used to display relevant advertising on our site and others. These ads are targeted towards users based on their browsing behaviour. Third party commercial cookies on our site may be used by selected partners to advertise their products and services on our site. How can I find Portugal Homes cookies? Does Portugal Homes use third-party commercial and analytics cookies? Yes, Portugal Homes uses third-party cookies from reputable, trusted online marketing and advertising companies. Portugal Homes may also use third party analytical cookies to enable the services that these third parties provide. All third party cookies are from providers which are committed to high standards of responsible data management and business practices. Whenever possible, we work only with online marketing and advertising companies which are members of the IAB (Interactive Advertising Bureau) and/or the NAI (Network Advertising Initiative), both of which are organizations which uphold industry standards and codes of conduct – members of the NAI and IAB also make it possible for consumers to opt out of behavioural advertising. Who has access to the data collected by Portugal Homes cookies? No one other than Portugal Homes has access to Portugal Homes cookies. Cookies which have been placed on the site by third parties are only accessible by these parties. Keep in mind that rejecting some cookies could limit your ability to use some of the functions of our website. If you opt out of an Individual advertising network, this does not mean that you will not receive any further ads or that your browsing behaviour will not be analysed; it simply means that the online advertising network you have chosen to opt out of will no longer deliver ads to you which are based on your browsing habits or other preferences. Does Portugal Homes use web beacons? Portugal Homes occasionally uses web beacons in addition to cookies. Web beacons are one-pixel images which are downloaded to your computer either in an email message including HTML or as part of a web page request. What kind of security does Portugal Homes have in place to protect user’s personal data? We operate our site in full compliance with applicable European Union data protection laws to prevent unauthorized parties from accessing or using your personal information. We also have security measures in place to ensure the safety of your personal data, including procedures and systems which restrict the access and use of personal data stored on our servers – this data is only accessible to a small number of authorized personnel who require access to this information to perform their work. The services offered on Portugal Homes are not intended for children under the age of 18. Children may use our services only with the explicit consent of their parent or guardian. We reserve the right to delete any information received from a child under 18 years of age. How can you control the personal data you've given to Portugal Homes? All users have the right to review any personal data about you maintained by the site. You can request to see this data by sending us a request via email at info@portugalhomes.com with the subject line “Request personal information.” Please attach a copy of your identification card to your email to help us make sure that unauthorized individuals cannot access your personal information. We’ll update any inaccurate personal information at your request. If you decide to stop using Portugal Homes services, simply ask us to stop using your personal data. 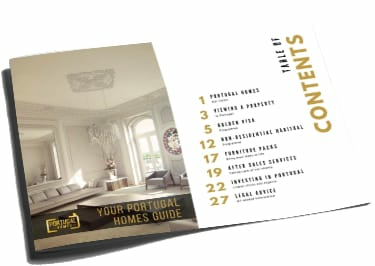 You can also unsubscribe from the Portugal Homes newsletter at any time by clicking on the “Unsubscribe” link found in each of our newsletters. If you want to update or block any of your personal data on Portugal Homes, simply send us a request via email at info@portugalhomes.com. Please note that some information may need to be retained for administrative or legal purposes. Who controls the processing of personal data on Portugal Homes?